Offcite reads the documents and provides some bullet points. The plan would dramatically widen I-45 to more than 30 lanes in certain sections. North of 610, I-45 would rival the Katy Freeway in its expanse. Though the west side of I-45 at Crosstimbers is largely vacant, TxDOT plans to take major right of way east of I-45 where many businesses thrive, including the Culinary Institute. The greater capacity to move automobiles might be accompanied by increased cancer risk and asthma for Houstonians generally, and for those living close to the path in particular. All of I-69 from Shepherd to Commerce Street would be sunk as deep as 20 feet below grade. 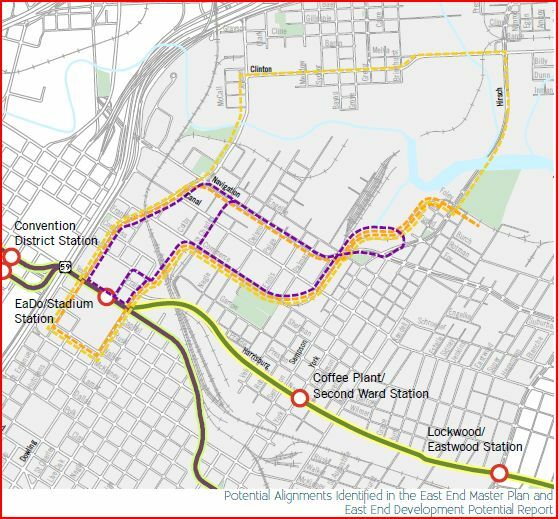 That is to say, all the above-ground sections in Midtown and the Museum District (Greater Third Ward) would be sunken and widened, radically transforming the landscape in these neighborhoods. As Tory Gattis notes, the plans would eliminate the bottleneck at Spur 527. Lofts at the Ballpark, Clayton Homes (public housing), and the SEARCH building (a 27,000-square-foot facility for services to the homeless that is just now breaking ground) are in the path of the widened I-45/I-69 freeway east of Downtown, and will be torn down at the expense of taxpayers. The section of the “Pierce Elevated” over Buffalo Bayou would be rebuilt with new Downtown connectors that TxDOT alternately describes as “parkways” and “spurs.” Though the official rendering is dull, the public-private partnerships that have rebuilt the parks along the bayous might help bring about new iconic bridges for cars. A Sky Park in this location is unlikely because moving traffic across the bayou is considered a major priority for many stakeholders. That’s a lot of real estate that could be sacrificed for this project, if it comes to pass – as the story notes, funding has not yet been secured for it. The bridges will be a contentious issue, at least in my neighborhood. Already there’s a disagreement between those who applaud and advocate for the closing of the North Street bridge, and those who want to maintain it so as not to cut off a large segment of the neighborhood from the east side of I-45. There are also some potentially good things that could happen, as item #2 points out. I’ll say again, if this goes through it will be the most consequential event of the next Mayor’s tenure. Sure would be nice to know what that Mayor thinks about it, wouldn’t it? 6 NEW B-stations coming this month! We are happy to announce our new locations! When we launched our pilot program in May of 2012 we were anxious and excited to see how Houston would respond to a bike share program. As you are probably aware, the reaction has been incredibly positive and we are now expanding again! We will be installing SIX additional stations later this month! 2. Taft & Fairview- 2401 Taft St.
3. The Menil Collection/ Alabama & Mandell- 1529 W. Alabama St.
4. Leonel Castillo Community Center/ South St. & Henry- 2109 South St.
5. Milam & Webster- 2215 Milam St.
6. Project Row House/ Holman & Live Oak- 2521 Holman St. The first three are basically Montrose – the far north end, the east side near Midtown, and farther south – the Leonel Castillo Community Center is north of downtown, just east of where I-10 and I-45 cross, the Milam location is on that dense little patch of Midtown just south of I-45, and the Holman location is east of downtown. As noted on Facebook when they teased the news last week, they’re spreading out from their “established footprint”, and you can sort of get a hint from there where they might go next. The Highwayman has more, including a map that shows all the current and new locations. There are a lot of freight rail lines in the East End. Some big changes will be coming to them. A series of underpasses and street closings east of downtown represents the latest effort to seal off railroad corridors and take vehicle traffic over or under the tracks, while closing off other roads. “If you look at the plan we have … you’ll see every place we closed a road is by a grade separation,” said Maureen Crocker, executive director of the Gulf Coast Rail District. Eliminating crossings by separating roads and rail lines with overpasses or underpasses is the best solution, but also the most expensive, officials said. “Anywhere a grade separation is done, you take away the conflict,” Crocker said. Where officials can’t eliminate the conflict, they are working to make drivers more aware of the trains, or to cut off access. 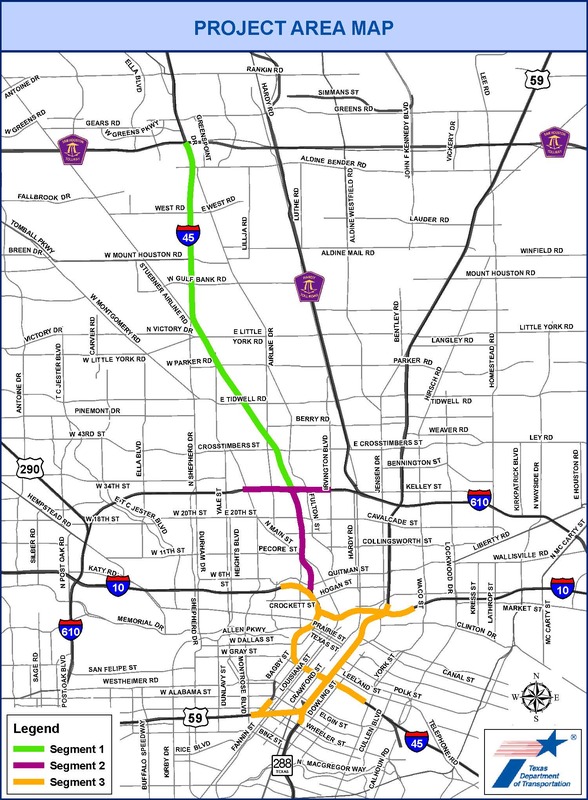 Five grade separations and five road closings are planned along nine miles of double railroad track, known as the West Belt, that extends from northside neighborhoods to southeast of the Third Ward. Most of the projects are east of downtown. At an estimated cost of $107.7 million, the closings and underpasses will create a roughly five-mile quiet zone where trains won’t blow their horns when they approach an at-grade crossing. That means fewer whistles for the 15,000 nearby residents, officials said. Funding for the project will come from federal, state, local and railroad sources, Crocker said, and potentially involves applying for a competitive U.S. Department of Transportation grant. There have been a number of collisions, resulting in 27 injuries and one death, at rail crossings in Harris County since 2010. 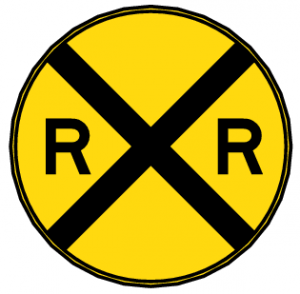 In addition to the changes at these crossings, there will be billboards put up to remind people that trains take a long time to stop, so you really ought to think twice about crossing a rail line if there’s any question about your ability to make it safely. You wouldn’t think that would be something people would need to be reminded about, but it is. One hopes this will help. Keep Houston Houston argues that street closures are a bad idea. Basically, closing a crossing is like parking a freight train in front of the gates 24/7. This is true if there’s no alternative for miles, and it’s equally true if there’s an overpass or underpass a block a way. Consider, for instance, the pending loss of Sherman Street. Right now there’s a bike trail that starts in downtown and ends one block away. But using Sherman you can keep going east, all the way to the Ship Channel, on a quiet, low-traffic, residential street. What happens if you close Sherman? Sure, it’s only a two block detour over to Harrisburg. But Harrisburg is a big, noisy street, with through traffic and light rail trains. This can only discourage cycling. And how ’bout if you’re on foot? That two block detour represents about six or seven minutes of walking time. It costs about as much time as a one-mile detour in a car. And slowly, bit by bit, neighborhoods are cut off from each other. It’s already happened in the First Ward. There used to be a nice quiet cut-through, Silver Street, that would take you from anywhere in the First all the way across Washington and down to Memorial. It was a great way to avoid the jam-up on Sawyer Street, or the racetrack on Houston Avenue, where HPD cruisers regularly hit 50-60mph on the way to and from headquarters. But now, it’s gone. Google shows the transformation. In Streetview, a nice straight shot. In 45-degree view, dead. All of this is enabled by laughable “cost benefit analyses” that weigh the “benefit” of crossing closures in terms of the accident reduction without considering any “cost” other than $50,000 for the barricades, signing and striping to close the thing. Lost time due to cars taking a longer route isn’t considered. Lost connectivity for peds and bikes isn’t considered. Lost ridership and productivity on transit routes forced to detour is not considered. If this same methodology was used on all transportation projects, the Interstate highway system would have a 10mph speed limit. It’s a good point. Silver Street is in the Washington Quiet Zone, and KHH is right that there aren’t any good alternatives for non-car traffic now that it’s closed. I think the effect is less pronounced west of Studemont, but that doesn’t help anyone who used to bike on Silver. No question, under/overpasses are the best option, if you can pay for them. I sympathize with the folks in the East End, who have dealt with freight rail traffic for a long time. I hope this is what they wanted.